This said that I had 2 days remaining in my current “cycle”. It also reported that I’d already submitted 100% of the CEUs; that’s because I passed a Microsoft exam in July 2012, so it’s not connected to the new Network+ exam, and I’d normally expect to see 0% there. Similarly, the dashboard said that I’d already paid $25 in annual fees; that’s correct, because I foolishly paid for my first year (non-refundable) before I realised that I wouldn’t have to pay that fee if I went for the Network+ exam. Again, that would normally say zero. So, they knew that I’d passed the N10-005 exam, and I had 2 new active certifications (A+ ce and Network+ ce). However, I still had a few more hoops to jump through. I can see the logic there: they don’t want to post the certificate to the wrong address. So, this was really just a formality, and if you haven’t moved house then you simply need to go to the Demographics page and click Submit. However, it’s worth noting that they didn’t send me any kind of email notification for this; you need to take the initiative by going back to the website. Note that the CE Intended Path box is disabled, and it currently says “A+” rather than “Network+”; this will be significant later. The CEU Progress section now listed the A+ce as being valid from 2015-04-24 to 2018-04-24. So, this is based on the date I took the exam rather than the original expiry date (2015-04-26). As before, the CEU Progress and CE Fees sections referred to “A+ ce”; they didn’t mention my new Network+ exam or qualification at all. Since you are now within your 1st annual period, there is a CE payment due for $49. I think that’s misleading, because it means that the due date will always be in the past, implying that I’m overdue with my payment. However, since it’s apparently a deliberate choice rather than a bug, I assume that they’re not going to change it. So, just be aware of it. As I mentioned before, you don’t actually have to pay any money until you’re ready to renew (and maybe not even then), so I’ll ignore it for the time being. This listed all 3 of my qualifications: my original “good for life” A+, and the new CE versions of A+/Network+. 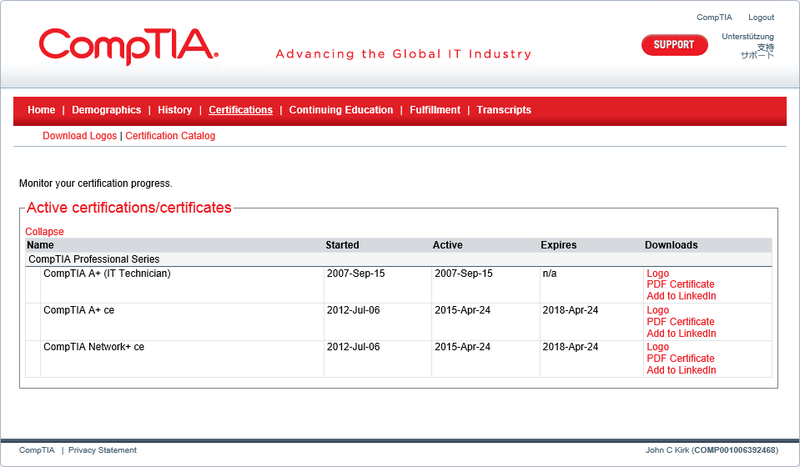 It’s interesting to note the start dates on the CE certifications: 2012-07-06 (the date that I took the Microsoft exam) rather than 2012-04-26 (the date that I enrolled in the CE program). It doesn’t really make any practical difference, but it seems like an odd choice. 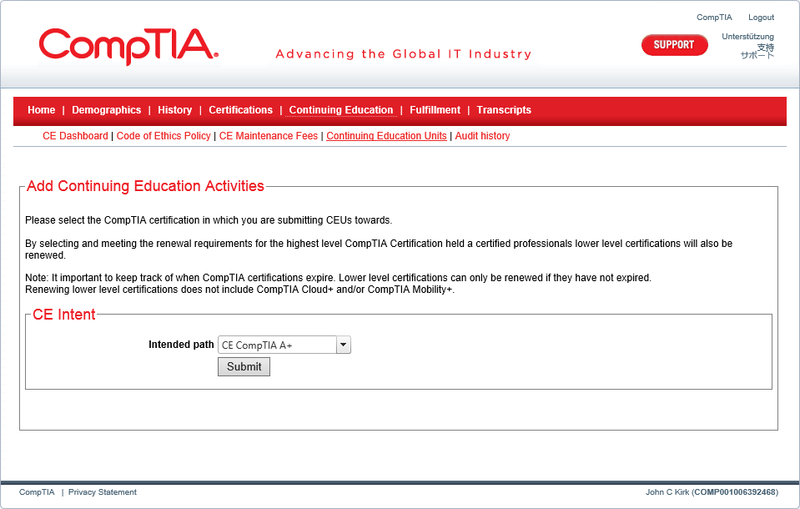 On the CE dashboard, it referred to my “certification intent level”. So, I needed to update that, but I couldn’t do it through the Demographics | Settings page. Instead, I went to Continuing Education | Continuing Education Units. 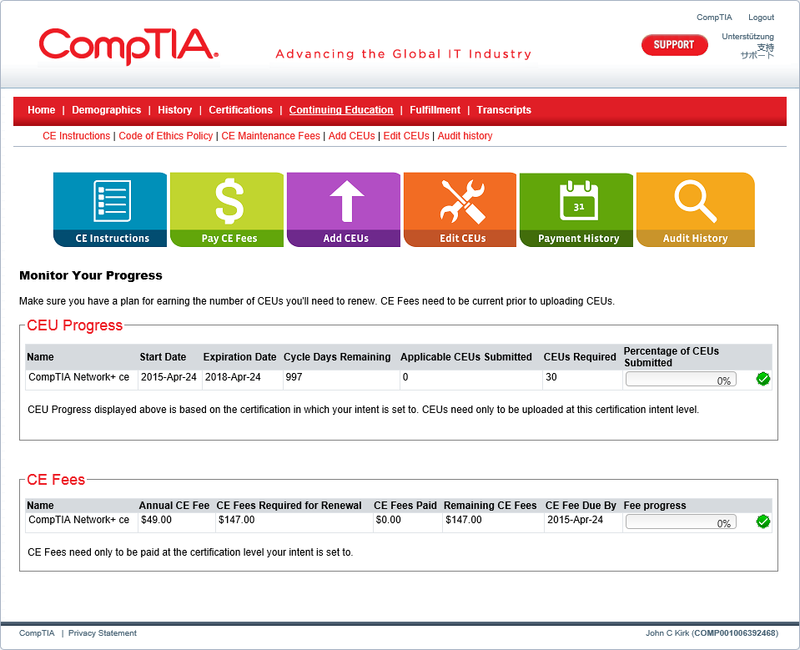 The CE Intent section displayed my intended path as “CE CompTIA A+”. This matched the corresponding box on the demographics page, but this time I was actually able to click the drop-down list. The list only showed A+ and Network+ (not Security+), i.e. it was filtered based on the exams that I’ve actually passed. That’s sensible, but I think it would be reasonable for the intent to automatically change rather than assuming that I want to let my new qualification lapse! I didn’t want to do that, because I won’t owe any fees if I take the Security+ exam next. When I clicked Submit, it took me to another page where I could pay fees. Again, I didn’t want to do that! The CE Intended Path box was still disabled, but it now displayed Network+ rather than A+. So, that’s good news: you can change the setting without paying a fee. 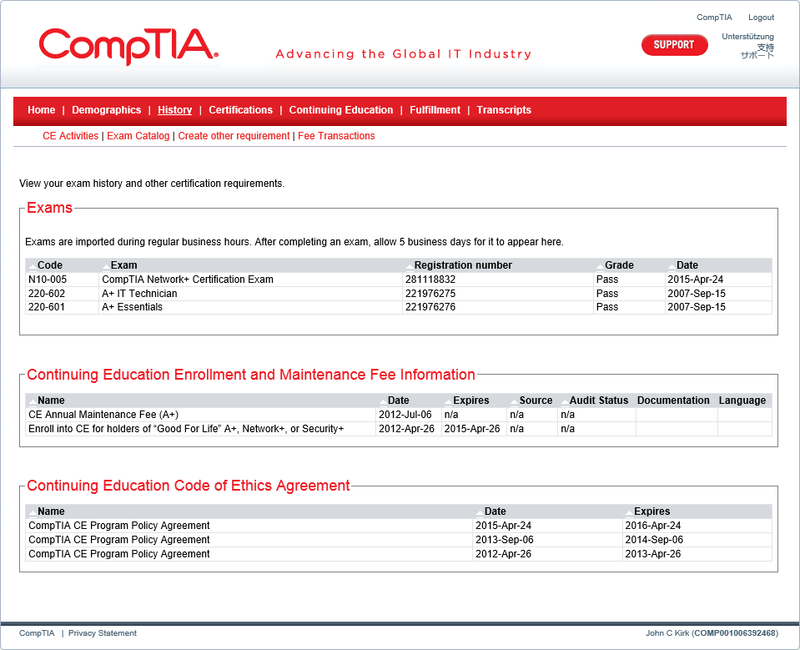 NB CompTIA have redesigned their website recently, so it now looks slightly different to some of my screenshots. 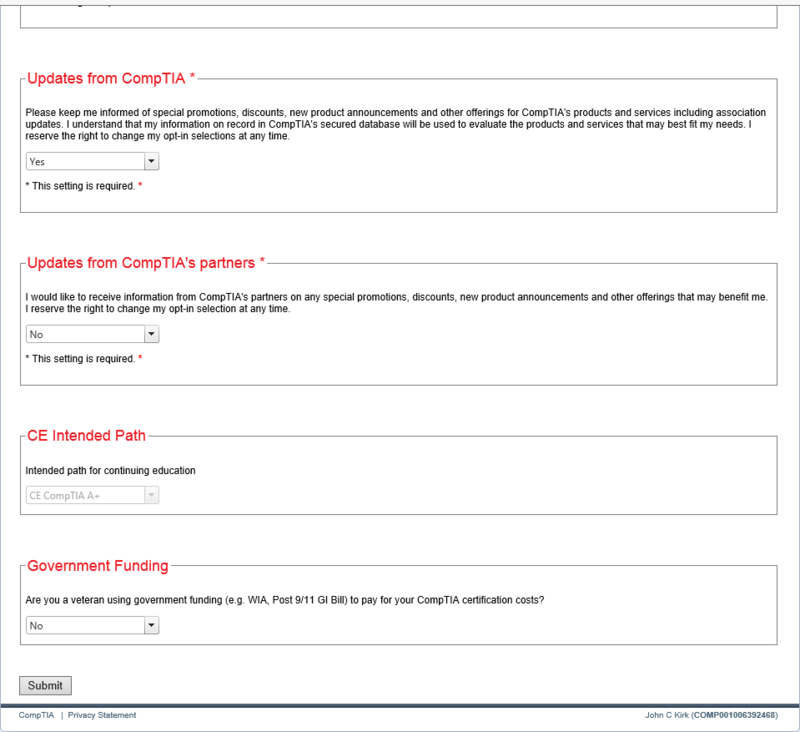 In particular, there’s no longer a menu option for CE Dashboard: you see similar information on the main Continuing Education page. They’ve also split the Continuing Education | Continuing Education Units page into Continuing Education | Add CEUs and Continuing Education | Edit CEUs. 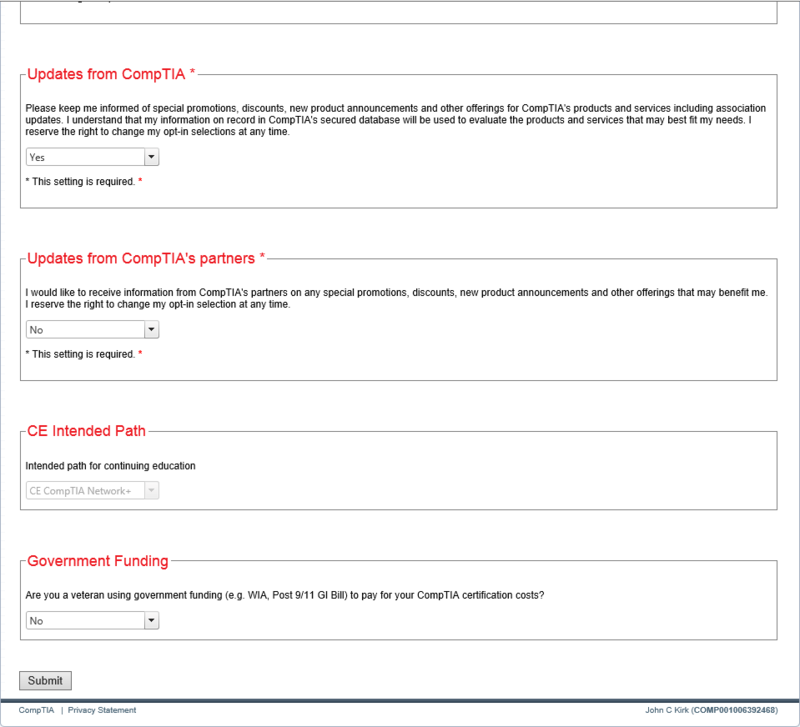 You may able to take a shortcut if you just go directly to the Continuing Education | CE Maintenance Fees page (as above) and make the change there. NB There was only 1 new entry here, because it's tracking exams rather than qualifications. 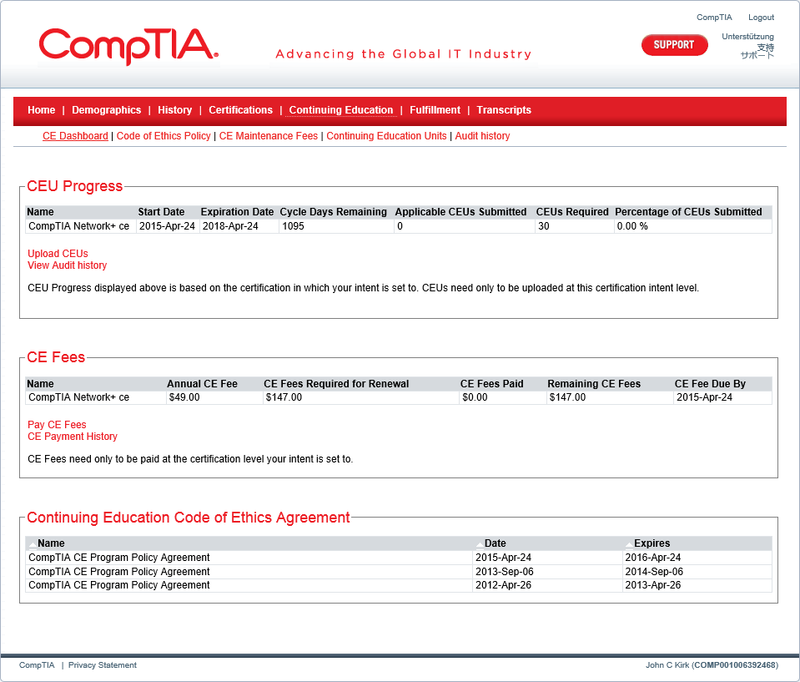 This also means that the “CEUs Required” has changed from 20 to 30, and my “Annual CE fee” has changed from $25 to $49. 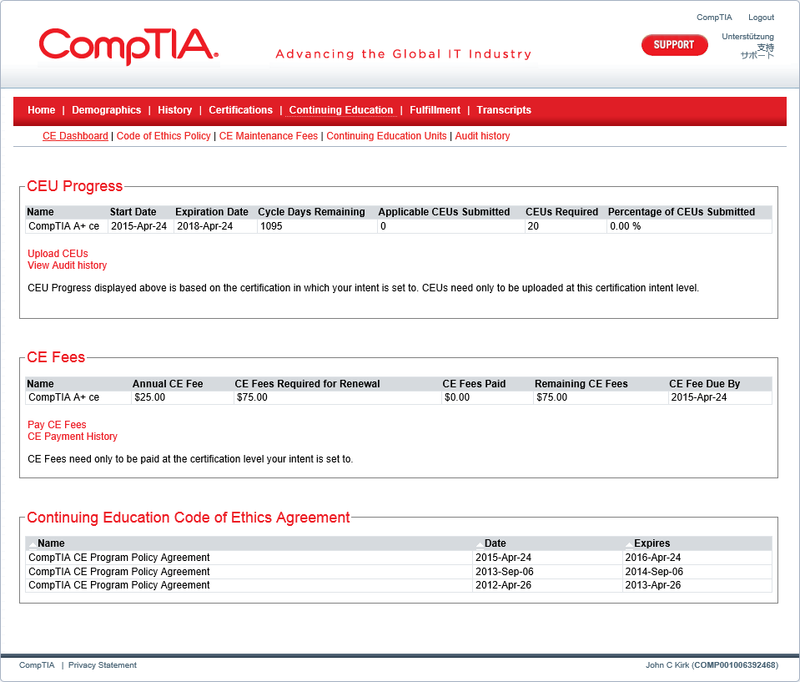 They’ve removed the Continuing Education Code of Ethics Agreement section; that info is still available on the History page, so there’s no need to repeat it here. 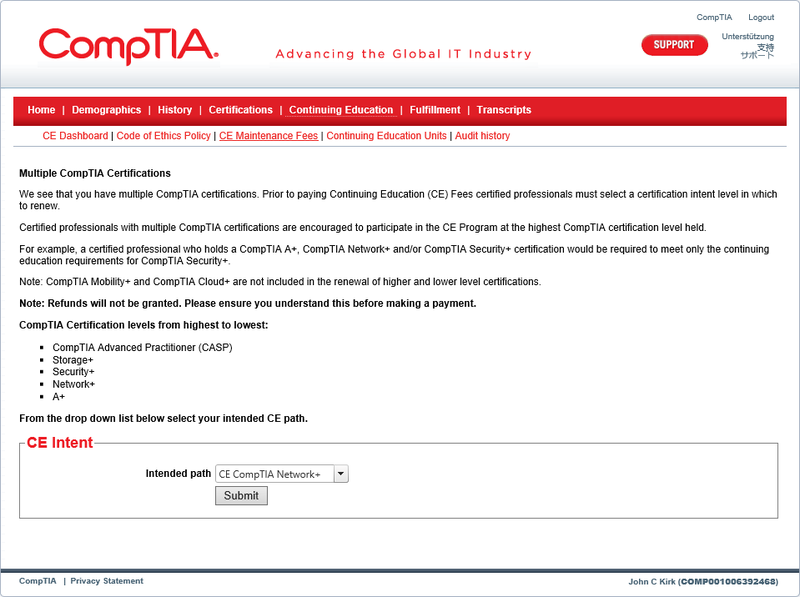 About a month later, I received a couple of letters from CompTIA, containing ID cards and certificates for my new qualifications. These came by airmail from the USA (Chicago) to the UK, which explains the delay. The Network+ ce letter arrived on 2015-05-22, and the A+ ce letter arrived on 2015-05-30. I’m not quite sure why they came separately, since the website said that they wouldn’t post anything until I’d confirmed my address, and at that point they’d already linked the new exam to both qualifications. It would also have been more cost-effective to put everything in the same envelope. Ah well, no matter. Now that I’ve sorted all this out, my basic plan is that I’ll never have to take the A+ exam again: I’ll keep that qualification up to date by doing higher exams every few years. Similarly, I think it’s unlikely that I’ll do the Network+ exam again. 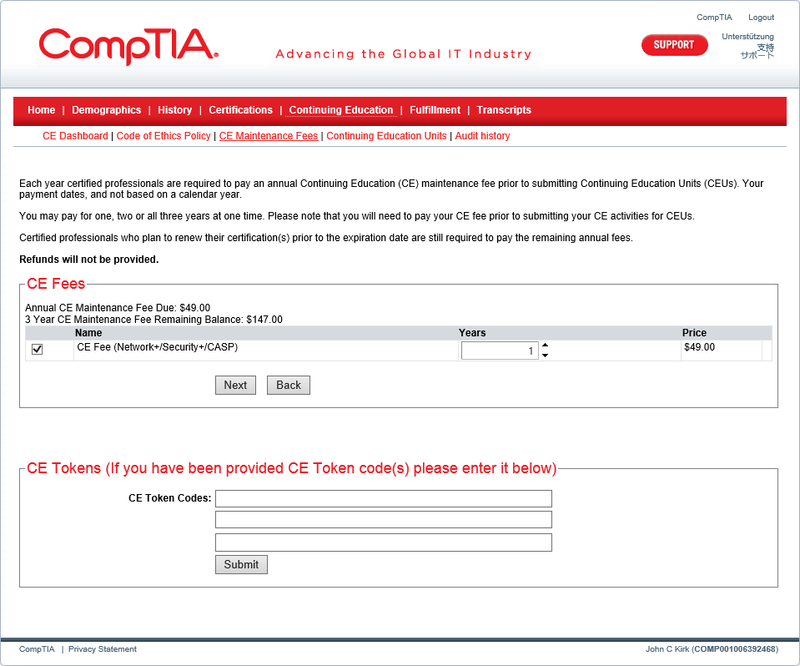 If I do the Security+ exam next then I won’t have to pay annual fees, but I will have to pay them if I stick at the same level (either Network+ ce or Security+ ce). As another option, I’ve already passed the CWTS exam; if I move on to the CWNA, that will give me enough CEU units to renew the A+ ce and Network+ ce (along with an annual fee); since I’d have to recertify for the CWNA every 3 years, that would be a viable long term strategy. Anyway, I’ve got 3 years to decide what to do.